I recently asked a Crossfit coach if he had a specialty. I was curious because I figured if he had a particular area of expertise, I might be able to connect with him on a different level than a CF coach, which I am not. I’m not a Crossfitter, don’t teach it and have no idea what my best Fran time is. But, if this guy was a weightlifter, we might talk about the nuances of the clean & jerk… or if he was a powerlifter, we might talk about the best bar to squat with… or if he was a kettlebell coach, we might talk about hardstyle vs sport training… and if he was a grip guy we’d definitely bend stuff. Anyway, it struck me as odd that I’d ask this guy about his specialty, its not a question I ask often, and as I thought about it later it prompted me to ask myself what my specialty was. If I had to give a general answer I would say my specialty is strength & conditioning, but if you pressed me to be more specific I’d say I specialize in strongman. How else could I explain the things I do and teach? I’m a “kettlebell, weightlifting, powerlifter who does grip feats” doesn’t exactly roll off the tongue. But even then, that still wouldn’t capture what I do. Where does my background in corrective exercise fit in this box? How do I explain my affinity for yoga sun salutations? 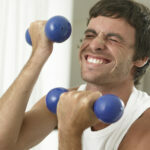 When does the work I’ve done in senior fitness come into play? My point is there is no other title that could describe me better because there are no boundaries in what a strongman can be an expert in. There are no limiting rules, fields or areas of expertise. As I have said before, oldtime strongmen were the worlds first physical educators. They started appearing long before health classes as street performers that stood on soap boxes and talked about the importance of physical vigor and natural living. They had varied backgrounds as wrestlers, lifters, handbalancers, circus travelers or simple hard working blue collar guys that taught themselves how to build health & strength. Their methods were just as random as their backgrounds. In addition to EVERYTHING that is being done now, they used tools that don’t get much attention today, like club swinging, strand pulling, dynamic tension, and my favorite, steel bending. I used to think of strongman as the competitive variety only, and while that certainly is part of it, I choose to embody the traditional strongman that incorporates whatever works. This attitude towards strength in its pursuit and as a lifestyle has much more to offer because it opens up an entire world to experiment with. All too often we get caught up with the “norm” of whatever circle we’re operating in and its good to look outside of things that are already being done. People like John Brookfield, Dennis Rogers and Bud Jeffries are a examples of modern day strongmen who have become innovators in the field of strength & conditioning. 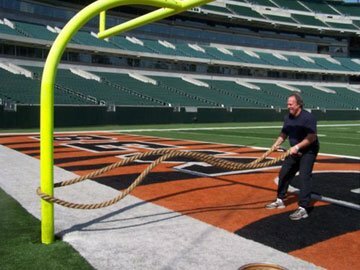 Less than a decade ago people scoffed at Brookfields battling ropes system, yet today countless professional athletes use it. Whoever would have thought shaking ropes could be such a good workout?